One of the points that I have tried to argue numerous times on this blog and elsewhere is that faith and reason are often set up as false dichotomy. 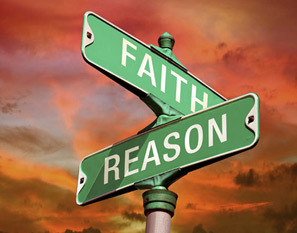 I cannot tell you how many times I have been in a conversation where someone has made the point that the more faith a person has the less reason they have and vice versa. This is all together false. However I do think there is a proper dichotomy between faith and knowledge. And here is where the professor’s argument has some merit. The professor is saying that the student doesn’t know there is a God and but that he only has faith that there is a God. I wonder if there are times that we confuse having a reasonable faith with having an empirically verifiable faith. I believe to my very core that we should have a reasonable faith. But I also believe it is impossible to have an empirically verifiable faith if for no other reason that once faith has been verified it is no longer faith but knowledge. I would go as far as to say that reason and faith take over there knowledge leaves off. In this passage God is telling us that we cannot and will not know his thoughts fully. Likewise we will not be able to understand everything he is calling us to do. Yet he is calling on us to trust in him and act by faith even though we lack some knowledge. I recognize that this passage is primarily concerned with love, however tucked in there is also teaching about knowledge and faith. Paul promises that there will come a time where a) I will know fully and b) faith and hope will conclude. Love is the greatest of the three (faith, hope and love) because when I am standing face to face with Jesus Christ I no longer need faith, my faith has been realized. Likewise I will no longer need hope, because what I have hoped for has come to pass. All that remains is love, and of course knowledge. This passage is the flagship verse for defining faith. Here it states that faith is having confident hope in something that I have not seen. Meaning it is not fully revealed and known to me. However right after the author of Hebrews gives this definition he talks about all of the great faith heroes. He gives us reasons to have faith based on the past. He gives example after example of people who successfully placed their faith in God. So even though their and our faith lacks complete knowledge we still have reasons to trust. We can have confidence that we have an informed, robust reasoned faith even if there are things we have not seen. The point that I want you to walk away with here is that if we try to make the argument that Christianity is an empirically verifiable faith we are not only wrong we have misunderstood what scripture teaches us about faith. However just because we cannot have fully verified faith (I.E. knowledge) we can and should have a well-reasoned faith.